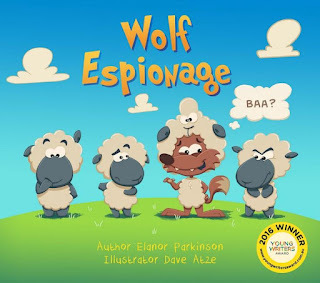 In 2016, the Redgum Book Club ran an Australian-wide children’s writing competition to find a picture book text to publish. The winner was a 12 year old girl who always wanted to publish a book. This is it! William the Wolf lives on Wellwood Farm, where, despite being surrounded by much livestock, he feels under-fed. Espionage – disguising himself as other animals -- is the way in which he seeks out food. However, in his sheep outfit, he fails with the sheep, and similarly with rabbits (‘they whacked him with their shovels’), and with the squirrels which (‘pummelled him with nuts’). Having failed so far, the cunning wolf rethinks his strategy and subsequently goes undercover, disguising himself as an apple and a pea. Neither, of course, attack him as the animals did. Voila! William is transformed into a vegetarian wolf. The last double-page coloured illustration shows William with the other animals on a picnic rug eating fruit and vegetables. Every one of the events which are documented take place on a specific day of the week, from Monday through the Saturday picnic – on Sunday the now confirmed vegetarian is ‘indeed a wolf in beet’s clothing’ -- a clever pun on a well-known saying. This is a simple tale which might well have been written by an adult -- so full marks to young Elanor. The book is well-designed and the cartoon illustrations do full credit to the text.